NO to prorogation! YES to democracy! Download promotional materials. Everything is available online - posters, leaflets, stickers, petitions, Facebook profile pics, etc. : http://groups.google.com/group/capp-outreach/files. Let us know where you can distribute them. Provide free photocopying or printing. Do you have access to a photocopier or heavy-duty printer? Can you do any free photocopying or printing (no amount is too small or too large)? Also let us know if your workplace, community group, local library, trade union or student union, place of worship, etc. can be a pick-up location for printed materials. If yes, email noproroguetoronto@gmail.com to let us know your address and dates/times when materials may be picked up. Join us for city-wide poster runs. On the following dates/times, meet us at Trinity-St. Paul’s Centre, 427 Bloor Street West, Suite 207, 2nd floor to pick up posters and postering materials (paste, staplers and/or tape) and to spread out across Toronto to put up posters everywhere we can. Bring your friends! Join us for city-wide leafleting sessions. On the following dates/times/locations, meet us to distribute leaflets as a large group to passers-by. We’ll bring all the printed materials, including display tables; you just have to bring yourself (and friends). Put up posters/distribute leaflets on your own time. All printed materials are available at Trinity-St. Paul’s Centre, 427 Bloor Street West, Suite 207, 2nd floor, seven days a week from 8:00am to 10:00pm. Distribute materials on busy street corners, at TTC entrances/exits, and in large apartment buildings. Just let us know where you’ve distributed materials so we know what parts of Toronto have been covered. Email noproroguetoronto@gmail.com. Donate funds. Canadians against Proroguing Parliament (Toronto) is a grassroots, non-partisan movement of ordinary Canadians. We urgently need your financial support to build and organize an effective rally that engages the public and gets its message across to MPs. Donate online at http://noprorogue.ca/. Look for the “Donate Now” box. Cheques and/or money orders should be made payable to “Shilo Davis” or “Justin Arjoon” (CAPP in memo area) and mailed to CAPP Toronto, 67 Griffiths Drive, Ajax ON L1T 3J8. Attend upcoming organizing meetings. We need as many volunteers as possible to promote the rally ahead of time, and to support the rally itself on January 23. If you’d like to volunteer, please join us. We meet on Fridays (January 15 and 22) from 5:30pm to 7:30pm on the University of Toronto downtown campus. For exact location, email noproroguetoronto@gmail.com. All are welcome! Promote the event online. Feel free to forward this email to family, friends, co-workers and/or anyone who cares about democracy in Canada. You can also join our Facebook group, where this movement got started: http://bit.ly/findusonfacebook. Or follow us on Twitter to get regular updates on your cell phone or online: http://twitter.com/NoProrogueTO. Thank you in advance for whatever support you can offer. We look forward to seeing you on January 23, if not sooner! For more information, email noproroguetoronto@gmail.com. 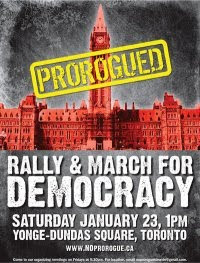 The Toronto rally is organized by Canadians Against Proroguing Parliament (Toronto), a grassroots, non-partisan movement of ordinary Canadians that emerged in response to Harper’s decision to prorogue Parliament. All are welcome to join us.